After a lengthy flight from California to Newark, Mike Yorkey makes his way into an apartment bedroom to introduce himself to Eric LeGrand. As he walks over to where Eric sits in his wheelchair, Mike extends a hand of greeting and realizes the only gesture Eric can offer in return is a smile. “I just lay my hand on top of his hand,” Mike remembers, and it is in that moment of connection a silent vow is made. Mike has come to help Eric write his story, and he will gently guide him through some of the darkest places he’ll be forced to revisit. It is the story of Eric’s paralysis, and instantaneous shift in his life’s trajectory, that brought Mike across the country to spend four days visiting the LeGrand home. 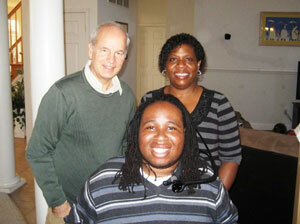 Mike went to Newark in April 2012 to capture in person the journey the LeGrand family has traveled since a traumatic football hit paralyzed Eric from the neck down on October 16, 2010. Together Eric and Mike will write Eric’s book Believe: My Faith and the Tackle that Changed My Life. During a game against Army, Eric, a standout-defensive tackle for Rutgers, was injured in a tackle during a kick-off return. Despite gaps in Eric’s memory of the first few days following the collision, he had a surprisingly detailed recollection of the hit itself. As the two men traveled back in Eric’s memory to the moment his life was permanently altered, a recorder captured it all. Investigating the three-dimensional version of Eric’s story included conducting in-depth interviews with people who could fill in the gaps, such as Eric’s mom and aunt, who were part of the unfolding tragic story. Mike recorded their personal accounts and formulated in his mind the best way to tell the whole story. As a behind-the-scenes writer, Mike looks and listens for impactful stories people have to tell. Part therapist, part transcriber, Mike offers a voice for those who live the stories but need help writing about them. There have been many, many stories to share. Mike has been a part of the writing or editing of more than 75 books. In addition to writing about health and wellness, money management, marriage strengthening, and God-inspired living, he has also penned stories about some of society’s most influential people. He has authored or co-authored books about a number athletes, including Tim Tebow, Sam Bradford, Colt McCoy, Kevin Durant, Kyle Korver, Jeremy Lin, Roscoe Tanner, Michael Chang, and Dave Dravecky. He also helped write a book with singer songwriters Marilyn McCoo and Billy Davis Jr.
Mike seeks out personal stories so he can create a book interesting enough for readers to continue to turn the page. “I can hang research on a story, but I need the personal story to make it work,” he says. 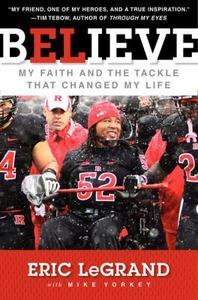 So, when Mike sits down with men like Eric LeGrand, he listens to the stories, pushes for the details, and applauds those things they are willing to share. The moment Eric dove in for the devastating tackle, his life’s story took a dramatic turn. Mike’s arrival at the LeGrand apartment, two years later, began another shift in the story. As the two men connected to bring Eric’s courageous journey to print, they were also adding chapters to what has become Mike’s life story, as storyteller. The Tampa Bay Buccaneers signed Eric LeGrand to their roster as an unpaid free agent the last pick of the NFL draft in April of 2012. Eric appreciated the gesture that fulfilled a lifelong dream to be a part of an NFL team. He held the roster spot just up until the day before the start of preseason when he announced his official retirement from football. He did not want to be in the way of another player who could have his spot. LeGrand currently busies himself with motivational speaking. He is represented through IMG Speakers Bureau. 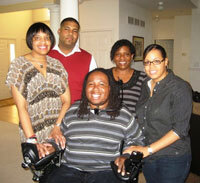 For more information about booking Eric LeGrand, contact IMG Speakers at 212-774-6735 or speakers@imgworld.com. Both photos courtesy of Mike Yorkey.